Hysterosalpingography (HSG) is a radiographic diagnostic study of the uterus and fallopian tubes most commonly used in the evaluation of infertility. Uterine abnormalities are thought to be a contributing factor in approximately 10% of infertile women and 50% of women with recurrent early pregnancy loss, while the prevalence of tubal abnormalities in infertility is approximately 20%. [1, 2] Thus, assessment of the uterine cavity and fallopian tubes is a standard practice in the baseline infertility workup. 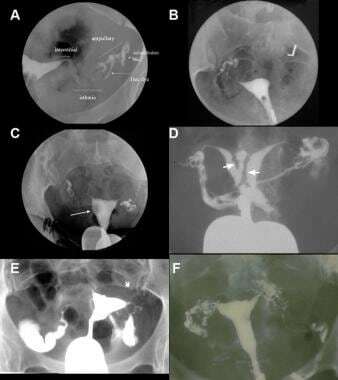 Examples of hysterosalpingogram (HSG) images showing: (A) normal tubal patency, (B) endometrial polyp, (C) submucosal leiomyomata, (D) intrauterine synechiae, (E) hydrosalpinges, and (F) salpingitis isthmica nodosum. Known contrast allergy, pregnancy, and active pelvic infection are absolute contraindications to the procedure. The procedure should be performed in the late follicular phase of the menstrual cycle to ensure that the patient is not pregnant and to prevent false-positive intrauterine filling defects and proximal tubal occlusion due to endometrial thickening. Some facilities perform routine pregnancy tests prior to the procedure, but this practice results in an unfavorable cost–to-benefit ratio. Brown SE, Coddington CC, Schnorr J, Toner JP, Gibbons W, Oehninger S. Evaluation of outpatient hysteroscopy, saline infusion hysterosonography, and hysterosalpingography in infertile women: a prospective, randomized study. Fertil Steril. 2000 Nov. 74(5):1029-34. [Medline]. Brunham RC, Maclean IW, Binns B, Peeling RW. Chlamydia trachomatis: its role in tubal infertility. J Infect Dis. 1985. 152:1275-82. Simpson WL Jr, Beitia LG, Mester J. Hysterosalingography: a reemerging study. Radiographics. 2006. 26:419-31. Roma Dalfo A, Ubeda B, Ubeda A, Monzon M, Rotger R, Ramos R, et al. Diagnostic value of hystersalpingography in the detection of intrauterine abnormalities: a comparison with hysteroscopy. Am J Roentgenol. 2004. 183(5):1405-9. Noorhasan D, Heard MJ. Gadolinium radiologic contrast is a useful alternative for hysterosalpingography in patients with iodine allergy. Fertil Steril. 2005 Dec. 84(6):1744. [Medline]. Silberzweig JE, Khorsandi AS, Caldon M, Alam S. Gadolinium for hysterosalpingography. J Reprod Med. 2008 Jan. 53(1):15-9. [Medline]. Beaty AD, Lieberman PL, Slavin RG. Seafood allergy and radiocontrast media: are physicians propagating a myth?. Am J Med. 2008. 121:158.e1-.e4. Karande VC, Pratt DE, Balin MS, Levrant SG, Morris RS, Gleicher N. What is the radiation exposure to patients during a gynecoradiologic procedure?. Fertil Steril. 1997 Feb. 67(2):401-3. [Medline]. Nikolic B, Spies JB, Lundsten MJ, Abbara S. Patient radiation dose associated with uterine artery embolization. Radiology. 2000 Jan. 214(1):121-5. [Medline]. Eng CW, Tang PH, Ong CL. Hysterosalpingography: current applications. Singapore Med J. 2007 Apr. 48(4):368-73; quiz 374. [Medline]. Saunders RD, Shwayder JM, Nakajima ST. Current methods of tubal patency assessment. Fertil Steril. 2011 Jun. 95(7):2171-9. [Medline]. Volpi E, Zuccaro G, Patriarca A, Rustichelli S, Sismondi P. Transvaginal sonographic tubal patency testing using air and saline solution as contrast media in a routine infertility clinic setting. Ultrasound Obstet Gynecol. 1996. 7:43-8. Swart P, Mol BW, van der Veen F, van Beurden M, Redekop WK, Bossuyt PM. The accuracy of hysterosalpingography in the diagnosis of tubal pathology: a meta-analysis. Fertil Steril. 1995. 64:486-91. Gaglione R, Valentini AL, Pistilli E, Nuzzi NP. A comparison of hysteroscopy and hysterosalpingography. Int J Gynaecol Obstet. 1996 Feb. 52(2):151-3. [Medline]. Golan A, Eilat E, Ron-El R, Herman A, Soffer Y, Bukovsky I. Hysteroscopy is superior to hysterosalpingography in infertility investigation. Acta Obstet Gynecol Scand. 1996 Aug. 75(7):654-6. [Medline]. Holz K, Becker R, Schürmann R. Ultrasound in the investigation of tubal patency. A meta-analysis of three comparative studies of Echovist-200 including 1007 women. Zentralbl Gynakol. 1997. 119(8):366-73. [Medline]. Boudghene FP, Bazot M, Robert Y, Perrot N, Rocourt N, Antoine JM, et al. Assessment of tubal patency by HyCoSy: comparison of a positive contast agent with saline solution. Ultrasound Obstet Gynecol. 2001. 18:525-30. Exacoustos C, Zupi E, Carusotti C, Lanzi G, Marconi D, Arduini D. Hysterosalpingo-contast sonography compared to hysterosalpingography and laparoscopic dye pertubation to evaluate tubal patency. J Am Assoc Gyn Lap. 2003. 10:367-72. Stumpf PG, March CM. Febrile morbidity following hysterosalpingography: identification of risk factors and recommendations for prophylaxis. Fertil Steril. 1980 May. 33(5):487-92. [Medline]. American College of Obstetrics and Gynecology. ACOG practice bulletin no. 104: antibiotic prophylaxis for gynecologic procedures. Obstet Gynecol. 2009. 113:1180-9. Thinkhamrop J, Laopaiboon M, Lumbiganon P. Prophylactic antibiotics for transcervical intrauterine procedures. Cochrance Database Syst Rev. 2010;CD005637. Owens OM, Schiff I, Kaul AF, Cramer DC, Burt RA. Reduction of pain following hysterosalpingogram by prior analgesic administration. Fertil Steril. 1985 Jan. 43(1):146-8. [Medline]. Handelzalts JE, Levy S, Peled Y, et al. Information seeking and perceptions of anxiety and pain among women undergoing hysterosalpingography. Eur J Obstet Gynecol Reprod Biol. 2016 Jul. 202:41-4. [Medline]. Ahmad G, Duffy JMN, O'Flynn H, Watson A. Pain relief in hysterosalingography. Cochrane Database Syst Rev. 2010;CD006106. Arnau B, Jovell E, Romero M, Gonzalez M, Esteba L, Garcia A. Lidocaine-prilocaine cream as analgesia for hysterosalpingography: a randomized, double blinded, controlled study. Eur J Obstet Gynecol Reprod Biol. 2014 Nov. 182:216-9. [Medline]. Lindequist S, Justesen P, Larsen C, Rasmussen F. Diagnostic quality and complications of hysterosalpingography: oil- versus water-soluble contrast media--a randomized prospective study. Radiology. 1991 Apr. 179(1):69-74. [Medline]. Thurmond AS, Hedgpeth PL, Scanlan RM. Selective injection of contrast media: inflammatory effects on rabbit fallopian tubes. Radiology. 1991 Jul. 180(1):97-9. [Medline]. Acton CM, Devitt JM, Ryan EA. Hysterosalpingography in infertility--an experience of 3,631 examinations. Aust N Z J Obstet Gynaecol. 1988 May. 28(2):127-33. [Medline]. Luttjeboer F, Harada T, Hughes E, Johnson N, Lilford R, Mol BW. Tubal flushing for subfertility. Cochrane Database Syst Rev. 2007;CD003718. Boyer P, Territo MC, de Ziegler D, Meldrum DR. Ethiodol inhibits phagocytosis by pelvic peritoneal macrophages. Fertil Steril. 1986. 46:715-7. Johnson JV, Montoya IA, Olive DL. Ethiodol oil contrast medium inhibits macrophage phagocytosis and adherence by altering membrane electronegativity and microviscosity. Fertil Steril. 1992 Sep. 58(3):511-7. [Medline]. Jack AE. Systemic reaction to radiocontrast media during hystersalpingography. J Allergy Clin Immunol. 1980. 66:242-3. Instruments required for hysterosalpingogram (HSG) include an open-sided speculum, tenaculum, sponge stick, antiseptic, contrast medium, and an acorn (Cohen) cannula (A) or a balloon-tip catheter (B). Positioning the uterus parallel to the x-ray beam is critical for evaluation. In panel A, the uterus is not positioned correctly, obscuring the uterine septum seen in panel B when the uterus is repositioned. Dramatic extravasation of contrast media is seen in the myometrial and uterine veins.